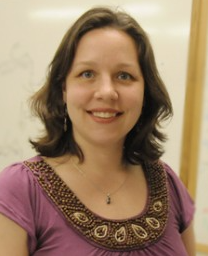 Erika Taylor, associate professor of chemistry, is a co-author of a paper titled, “Methyl transfer by substrate signaling from a knotted protein fold,” published in the August 2016 issue of the Nature Structural & Molecular Biology newsletter. The paper describes the protein TrmD, an enzyme that catalyzes tRNA modification, but unlike most proteins, TrmD has an “interesting knotted configuration, which is not common,” Taylor said. The paper demonstrates that even in proteins with knotted configurations, the internal protein movements and dynamics are important for binding, signaling and catalysis. “This is exciting because one might expect knotted proteins to be more static in their structure due to the knot, where the amino acids wrap in on themselves, but the evidence suggests that protein dynamics are just as important in these types (knotted configurations) of proteins,” she said.